The journey is first started for indie game studio MogaMecha in Global Game Jam 2012. It was an intense 48-hour which embrace hard work and fun together. We were quite an unbalanced team with 3 designer and 1 programmer. Maybe just because of this, we spent more than half of our time with thinking about an unconventional game mechanic. It was the time which we really became desperate when Fatih throw an idea about a comet and planets. He said that “think about a comet which can only be controlled by the help of planets’ gravity!” All of us stopped and think about it for a second. 1 minute later, all the team started to work on this idea. Mert was looking for planet textures, Fatih was dealing with the logo, Oz Tova was waiting for Maya to run and Erdin was already writing the 5th line of the code. At the end of this 48-hour we have a game which is a little bit far away from what we originally wanted to do. Yet, the people around seemed like they liked the core mechanic game as we also do. While going our homes at this harsh winter day, all we think was to keep up with this journey. And we really did it! After 18 months of extra development (we know it is little bit long for a mobile game) we came up with the Release Version of Save the Comet for Android, iOS and Windows Phone. We hope you'll enjoy the game. 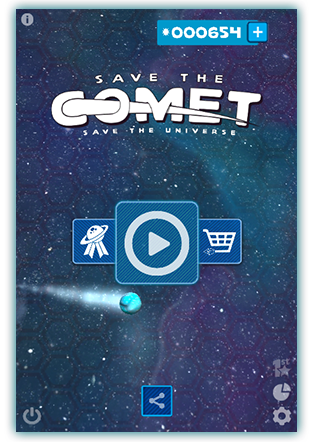 Save the Comet is a space themed infinite gravity action game where the main goal is to beat the high score. However, as can be seen from the core mechanic instruction, the gameplay is kind of different as it combines gravity with action and pace. In Save the Comet, you need to exploit planets, destroy meteors, get rid of asteroids and run away from Hypernova to achieve the highest score. Yet, besides beating the highscore, you will be able to explore the different parts of the galaxy and fight until you see the End! Think about the Universe. Think about how vast it is, how massive it is!There is no boundaries, it is spectacular with all these shiny planets, stars and so on. These all things are in an order and maintain their life in harmony. Having the same routes, hanging on in same orbit for millions of years. Sounds unbelievable, doesn't it? Now think about it again! Doing the same thing for millions of years?Being in the same place, saying hello to same planets, taking care of the same moon, obeying to same sun! For millions of years? Is it really fascinating or did it start to sound a little bit BORING? Yeah, the story of behind the game is about the Comet who wants to break break its chains and explore the universe. That BORING universe. Any details about Comet? Are you curious about what it is, where it is coming from, why you are trying to save it? Sorry pal, no clue here! 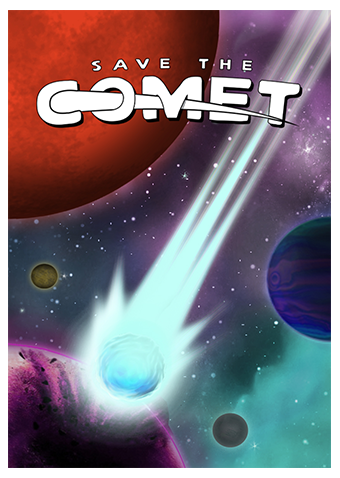 Play the game, explore the universe and reach the END!Then you will learn some mystery about this little comet. 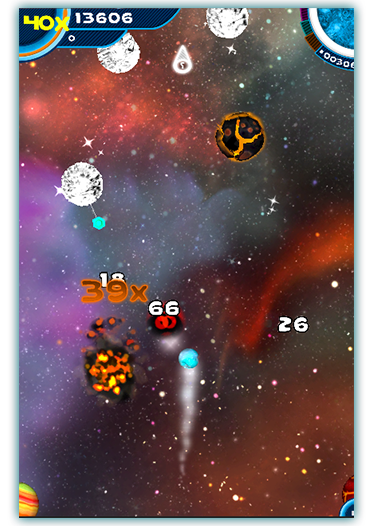 The core mechanic of the game is to move the planets and benefit their gravity to control the Comet. When the Comet gets in the gravity range of a planet, it will start to gain score, stardust and combo count. By slaloming through planets, you need to collect points and make combo counts as much as you can. Besides these, you also need to destroy meteors, scramble asteroids and run away from hypernova if you do not want to die. You will come across with plenty of different types of planets and other types of cosmic stuf during your joruney. Let's talk about them for a second. You will find bunch of perks and customizations in store. Besides, you will also be able to activate some one use elements before starting the game. Let' see what do we have in Store? Want to have a thicker skin? Then unlock this perk and become invulnarable in case you hit a planet, meteor or whatever. We know that you want to explode everything around. Then Rage is just for you. After unlocking Rage you can collect the startdust of the planets which you destroy. Bothering yourself because of the planets you missed? Do not bother anymore. 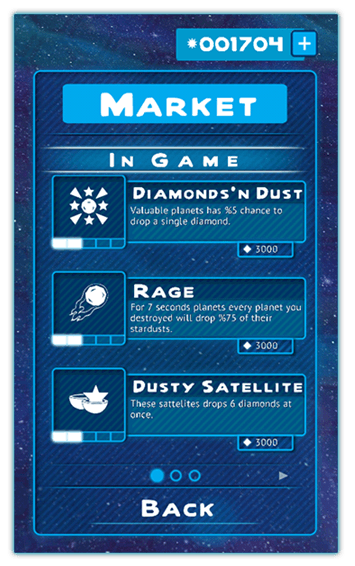 Unlock this one and start to collect stardust of the planets all aorund. You have never ever experienced the gain that much stardust at one time. Unlock this one and earn lots of galactic stardust at once. This one makes rich planets richer! These items are power ups which can be bought just before starting the game! Ouroboros: Gives you one more chance when you chrash. NoHurry: Bypasses the combo cooldown for a limited time period when activated. Fertility: Stardust you get will be multiplied by 2. 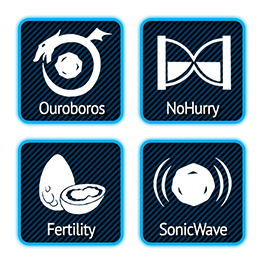 SonicWave: Make a double touch and test the mighty SonicWave! There are number of achievements in the game. Do you want to read all of the here? Don't think so! You will see some of the very exciting ones. But we'll keep the rest to the game. Play the game and learn the rest! Aerialist: Near miss 25 meteors! Want more? Install the game!